2. A Baraita printed by Grünhut, in "Sefer ha-Liḳḳuṭim," ii. 20b-21a. It contains the sayings of R. Phinehas b. Jair and R. Eliezer ha-Gadol on the Messianic times and on the various degrees of piety given in Soṭah ix. 15. The character of these sayings vividly recalls that of the apocalyptic writer. This, together with the fact that the aphorism on the degrees of piety is ascribed to Phinehas b. Jair, who may be correctly designated as an Essene, gives likelihood to the assumption that the passages in consideration are really the fragments of a Baraita collection with Essenic tendencies in apocalyptic manner. The doubt that exists whether or not the sayings of Phinehas b. Jair on the degrees of holiness belong to the Mishnah (see Lipmann Heller, ad loc.) strengthens the supposition. 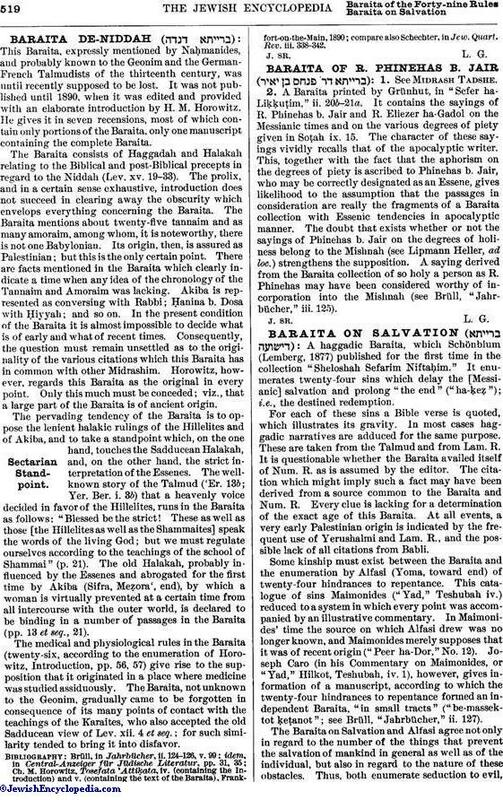 A saying derived from the Baraita collection of so holy a person as R. Phinehas may have been considered worthy of incorporation into the Mishnah (see Brüll, "Jahrbücher," iii. 125).